I visited the site of the Plymouth colony some years ago in Massachusetts and was given a private tour by the “unofficial” historian of Plymouth, Pastor Paul Jehle. He even brought me into the Pilgrim library and archives (off limits to most visitors) and allowed me see and hold William Bradford’s personal Bible. Bradford was the most famous of the Pilgrim governors, and his large Geneva Bible came wrapped in a carved, wooden cover. He authored the most important book ever written on the Pilgrims–Of Plymouth Plantation–which I have in my library. It’s a fascinating read describing the terrible difficulties of their journey to the New World, the harsh conditions in New England, the friendship they built with the Indians (through Squanto and others), and the eventual first Thanksgiving. In my early years I thought “Thanksgiving” was just a general idea the Pilgrims came up with one autumn due to their strong faith. 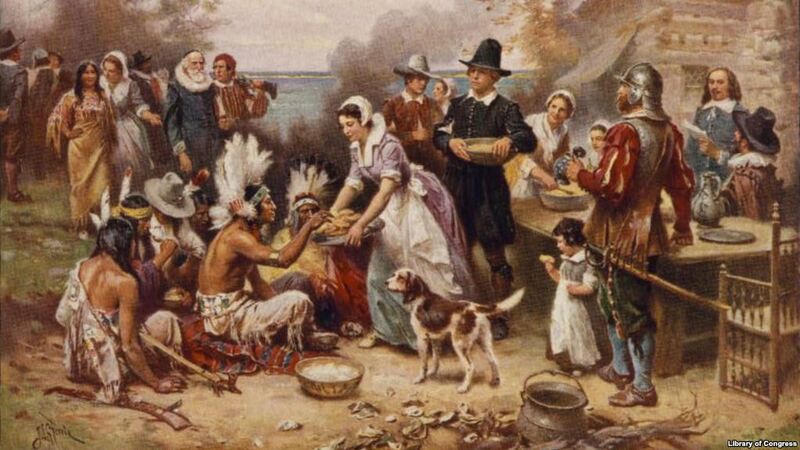 The truth is, the American version of Thanksgiving came about because of a sovereign MIRACLE God provided that caused an overflowing of gratitude. Only a few years into their settlement, the Pilgrims encountered a deadly summer drought that nearly killed all their crops–especially the corn. Facing a possible famine, they called for a day of fasting and prayer–which God answered directly with plenteous rains that “greatly revived the crops and left the Indians astonished” (Bradford’s eyewitness account). This miracle led to a special day of Thanksgiving–after the harvest. We will build on that tradition this Thursday. A few weeks ago, in my regular devotions, I drank in the breadth and beauty of Psalm 136–the great song of Thanksgiving of the Hebrew people. It’s one of the few chapters in the Bible that was probably written as a responsive reading for group worship. We need to wrap our minds around this incredible thought every minute of every day. Upon further analysis of the Thanksgiving Psalm, you will notice that it contains five different sections that help direct our praise to important areas of meditation. In verses one-to-four, the writer focuses on thanking God for Who He is. His essential nature is good. He is the only God that exists and reigns as our loving Lord and Master. He is also the author of all the seen and unseen miracles in our lives. In the next five verses (5-9), the author praises God for different aspects of his creation–the beautiful world all around us that was made (not evolved) from an infinite Creator and Architect. Nature’s awesomeness and beauty shout out God’s praise and give us infinite reasons to worship our Intelligent Designer. Then, this contagious psalm turns to Israel’s personal story of God’s love, deliverance, and providence (verses 10-22). The Israelites were an oral-based culture. Much of their history was passed on from generation to generation through stories and songs people committed to memory through repetition. The central 13 verses taught the history lessons of their past. These “personal touches,” among the general reasons to worship God, stood unique to them as a people. Verses 23-25 spoke even more intimately to the Hebrew nation. God cared about their daily needs for strength, salvation and even food (daily bread). Yes, God was the provider of the “big” miracles as well as the “small” items of life. Then the psalmist ends where he began–giving thanks for who God is–their Father in heaven, the only God. Forever is never ends. In New Testament terms it means enjoying intimate relationship with God through all eternity because of your faith in his goodness and grace as accomplished through Jesus Christ’s death and resurrection. Our faith brings His love into our lives–forever. Take some time to meditate on Psalm 136 this week. You might want to personalize each section. What aspects of God’s character are you thankful for? What brings awe and wonder to you in his creation (gardening for me!)? List at least 13 of them as the psalmist did. All of our lives are different–but contain manifold personal blessings from God tailored to the life He gave you. Then, remember how weak you really are, how He saved you from your sins, and how He provides for you daily–even your Thanksgiving meal. Finally, conclude your hallelujah session with a shout of triumphant praise! 1 Give thanks to the Lord, for he is good! His faithful love endures forever. 2 Give thanks to the God of gods.His faithful love endures forever. 3 Give thanks to the Lord of lords. His faithful love endures forever. 4 Give thanks to him who alone does mighty miracles. His faithful love endures forever. 5 Give thanks to him who made the heavens so skillfully. His faithful love endures forever. 6 Give thanks to him who placed the earth among the waters. His faithful love endures forever. 7 Give thanks to him who made the heavenly lights—His faithful love endures forever. 8 The sun to rule the day. His faithful love endures forever. 9 And the moon and stars to rule the night. His faithful love endures forever. 10 Give thanks to him who killed the firstborn of Egypt. His faithful love endures forever. 11 He brought Israel out of Egypt. His faithful love endures forever. 12 He acted with a strong hand and powerful arm. His faithful love endures forever. 13 Give thanks to him who parted the Red Sea. His faithful love endures forever. 14 He led Israel safely through. His faithful love endures forever. 15 But he hurled Pharaoh and his army into the Red Sea. His faithful love endures forever. 16 Give thanks to him who led his people through the wilderness. His faithful love endures forever. 17 Give thanks to him who struck down mighty kings. His faithful love endures forever. 18 He killed powerful kings—His faithful love endures forever. 19 Sihon king of the Amorites–His faithful love endures forever. 20 And Og king of Bashan. His faithful love endures forever. 21 God gave the land of these kings as an inheritance–His faithful love endures forever. 22 A special possession to his servant Israel. His faithful love endures forever. 23 He remembered us in our weakness. His faithful love endures forever. 24 He saved us from our enemies. His faithful love endures forever. 25 He gives food to every living thing. His faithful love endures forever. 26 Give thanks to the God of heaven. His faithful love endures forever. Giving thanks to God dims the fake news and self focus and causes us to meditate on the Good News and its author. “Give thanks to the God of heaven. His faithful love endures forever” (Psalm 136:26). Larry and I pray for a very happy and joyful Thanksgiving for you and your loved ones. We will be sharing the day with our neighbors.